I bet you are really good at reading and creating bar graphs. I also bet you can read circle graphs ... but I think circle graphs are a little harder to create. This web activity will not help you become better at bar or circle graphs. 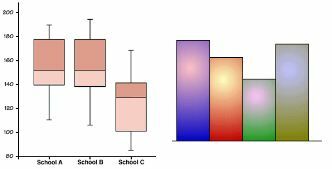 It will help you to use and become familiar with some new data tools ... line plots, box and whisker plots, stem and leaf plots, and Mean Absolute Deviation. There are many terms and concepts that you have probably seen before but now need to know soundly in order to proceed with the ideas that will be introduced here. I've arranged this web activity so that you can quickly skim over what you know and look more carefully at what you may not know very well. To make sure that you are competent on each topic, click on the link that follows each topic and refresh your memory or enrich your understanding. After you have reviewed a link, use your browser's back button to return to this site or use the buttons at the top or bottom of the page to continue to another lesson. There are 3 lessons involved in this activity. Use the following links to complete each lesson. Web links from Jennifer Nord at Northern Michigan University; [email protected].